Every January, the good people Down Under celebrate Australia Day! It is summertime in the Southern Hemisphere, so much like we celebrate the Fourth of July, Australians enjoy barbeques, concerts, and fireworks on this summery holiday. Those of us in the middle of winter in the Northern Hemisphere could use a little summer right about now! 😉 It is quite chilly, dark, and wet in Seattle. These little Pavlovas with lime curd and finger limes were just the things to brighten up a winter day. 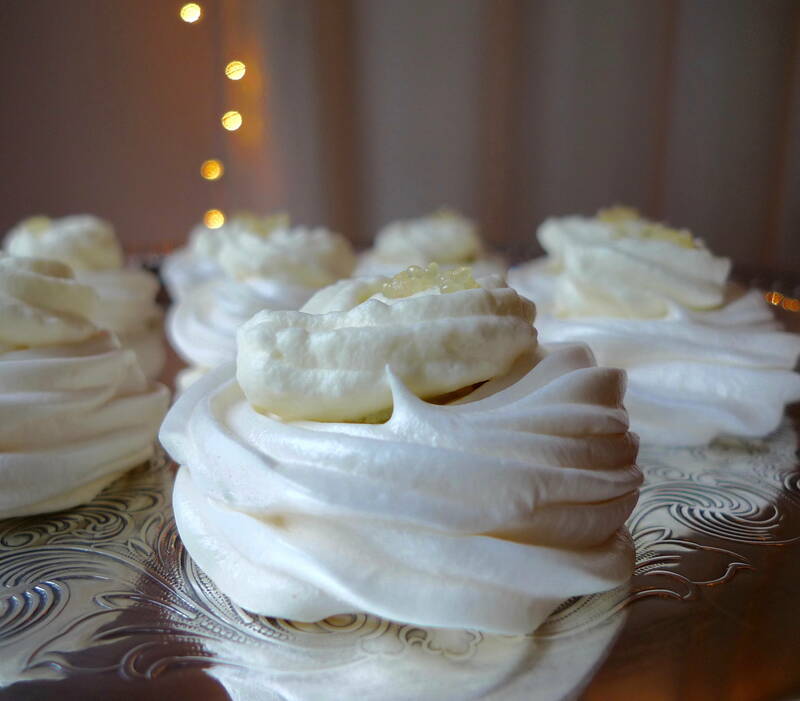 Pavlovas are a quintessential dessert of Australia, where finger limes are also native. I couldn’t think of anything more perfect to celebrate this special day. In a medium saucepan, add the sugar, eggs, juice, and 2 teaspoons of zest. Heat over medium high heat. Whisk steadily until the mixture begins to bubble gently and thicken. Remove the pan from the heat, and whisk in the butter. Strain the mixture. Then add the remaining zest, and stir well. Chill the curd. Preheat oven to 225 F. Line 2 baking sheets with parchment paper. Wipe the bowl and whisk attachment of a stand mixer with vinegar to ensure it is free of any oil. Add the egg whites and cream of tartar to the bowl of the stand mixer, and whisk until they begin to look frothy. Very slowly sprinkle in the sugar while continuing to whisk. The mixture will become thick and glossy with stiff peaks. Rub a small amount of the mixture between your fingers, and if it is smooth with no sugar granules remaining, you are there. At this point, add the salt, cornstarch, and vanilla, and whisk until just combined. Transfer the mixture to a piping bag fitted with a large star tip. On the prepared baking sheets, pipe the mixture into small rounds, leaving a small indentation in the middle of each meringue. Bake for about 1 hour and 15 minutes. Then turn off the oven, but leave the meringues in the oven for another 30 minutes. Let cool completely. In the bowl of a stand mixer fitted with the whisk attachment, whip the heavy cream and sugar until soft peaks form. (You want to whip it slightly less than you would like your finished product to be, since piping the cream will continue to stiffen it.) Transfer the whipped cream to a piping bag fitted with the same star tip used for the meringues. 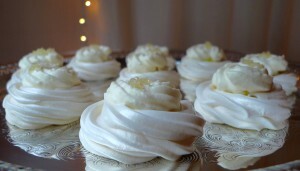 Dollop a little lime curd in the middle of each meringue. Pipe a little whipped cream over the top. Finish with a few pieces of finger lime on top of each Pavlova.